I love this season. I love the gift of Jesus. I am constantly in awe that God so loved the world that he gave his only son so whoever believeth in him shall have eternal life. Can you imagine the breadth, depth and height of that love? I cannot, my mind simply is unable to comprehend the divine and quite frankly, I love that too. Let me share my most recent encounter with God's outrageous love. Recently the AHG Staff embarked on a Bible Study following Randy Alcorn's Study Guide entitled Heaven. It was astonishing to see how varied our thoughts on heaven really were. It was fun to go on a journey of discovery with my fellow ministry workers, learning more about heaven while seeking to remain true to what scripture tells us about our final "resting" place. It was also a great time of reflection during this season of joy, to realize that this is what it is all about - living the Christian life - loving God always and hoping to one day rest on the lap of Jesus in the home he has prepared for those who love him. After several weeks, it became time for me to conduct the study. I was not having an easy time of it. My prayer for clarity and wisdom as I read Revelation and Isaiah seemed to be unanswered. I found my mind confused by my preconceived ideas and what Scripture seemed to be saying. My concordances were of no help. Frustrated I resigned myself that my study would not be anything special, I would simply read the questions from the guide and go through the motions. So unlike my nature, I was disappointed in myself at my resignation and thought I would flip on the news and simply call it a day. Well as God tends to do, He had a very different plan for me that evening. He took control of technology. The satellite was out on the TV (this was a first!) which forced me to continue to dig deeper on the subject of Will There be Relationships in Heaven? , the subject I was to share with the Staff. Bleery eyed, I opened my nightstand packed full of the books I would get "round to." There on the top of the stack was a bright yellow book with a sweet little boy on the cover - a gift from my assistant last Christmas, one she felt the Lord was prompting her to purchase for me. 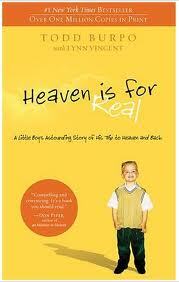 I too felt the Lord's prompting , this time to read the small book as it was entitled, "Heaven is for Real." Perhaps this small volume, could help me understand what God wanted me to share for the Bible Study, I thought. That night was incredible. The book was not closed except for short prayers of thanks I sent to the Lord. In less than two hours, the book was complete and the Holy Spirit had filled my soul, a sweet communion, one which I desperately needed. Once again, God used a child to share an important message to His people. The story is powerful, the message life changing and the joy it will give you will make this blessed season particularly memorable. Consider the quick yet impactful read of Heaven is for Real, a Little Boy's Story of His Trip to Heaven and Back by Todd Burpo, this Christmas season and celebrate the depth, breadth and height of God's love. I pray that it touches your soul as it did mine. And I thank God daily for allowing me to minister on behalf of His children. They teach us such important faith lessons. our whole family has read this book! my 11 and 13 year old daughters have a glimpse of the throne room now... it inspires faith! highly recommend! !